4GB kit (2x 2GB) PC2-3200R ECC REG 240pin 400Mhz. Dell Poweredge 1950 III - 2x 2.50Ghz Quad core (Total 8 Cores & Power Saving CPUs). 16GB PC2-5300F DDR2, 2x 73GB SAS 15K 3.5 Hot Plug Drives , Dell SAS 6i/R Integrated SAS / SATA Controller card, 670W Dual PSU Power supply , Dual Embedded Gigabit NICs. 2 x Intel® Xeon® Quad-Core 2.50Ghz 1333 MHz FSB, 64Bit 12MB L2 cache - Intel® Virtualization Technology (Intel® VT) Xeon® Quad-Core L5420. (Total 8 Cores) - Low Power Consumption. 16GB DDR2 PC2-5300F Fully Buffered Original RAM (64 GB maximum). Performance Models: Dell SAS 6i Integrated SAS / SATA RAID Controller card. 2x 73GB SAS 15k 3.5 Original Dell HOT PLUG drives. Two available PCI-Express slots, optional mixed PCI-X / PCI-Express configurations available. USB 2.0 support :- 5 total ports: (2) ports up front; (2) ports in back; (1) port internall. 2x Power Supply Installed (Dual 670W). Rack (1U), (3.5-inch); Depth 26 inches (66 cm). NO Original Dell Front Metal Bezel/Cover. This is an ex-corporate Server. Cleaned, fully tested and inventoried. They will have some signs of normal usage. Installed and Tested with VMware ESXi 4.1 & Microsoft Windows 2008 R2 Trial Version. No Software or any kind Licence is included with this sale. Upgrade to 2x 2.66GHz 12MB L5430 Quad- Core Intel® Xeon® CPU's for. Hard drives: 8x Dell 146GB 2.5 Hot Pluggable SAS SFF drive for. Memory: Upgrade to 32GB PC2-5300F Fully Buffered for. Communications: HP NC373F PCI-E Multifunction 1000SX Gigabit Server Adapter for. We have some of the world's finest certified IT engineers on site to suit your needs. Anisa Technologies Ltd , located near Ealing Broadway, W5 West London, is one of the fastest growing companies in the refurbished server business. Because we are experts in the refurbishing process, we are able to deliver cost-cutting solutions to our customers. We specialize in Dell, IBM and HP lines of servers and storage units, as well as Cisco networking equipment. The rack-optimized, Intel-based, two-socket 1U Dell PowerEdge 1950 III server delivers the right combination of computing power and availability for organizations who seek rack density. Streamlined Virtualization Dells PowerEdge 1950 III offers outstanding virtualization performance in a 2-socket 1U server combined with optional, factory integrated virtualization capabilities. Dell continues to simplify virtualization by streamlining virtualization deployment and providing ease of use in virtual infrastructures. By factory integrating VMware® ESXi 3.5, customers receive VMware capabilities and migration of virtual machines within a few clicks of a mouse. CHOOSE SERVICES, SOLUTIONS, AND SPECIFICAT IONS To customize your server today, talk to your account manager or visit dell. For example, you have the freedom to choose either two high-performance 2.5 or two low-cost 3.5 hard drives depending on what youve decided to standardize on. Then choose from the industrys widest variety of complementary hardware, software, and external storage solutions. Customers concerned with space are often also concerned with energy consumption. In many regions of the world, we offer a suite of services to help you optimize the design of your data center. Now we are beginning to migrate components from these servers into our mainstream servers. We also have introduced real-time power monitoring in the server (not the PDU) based on the PMbus industry standard. As reliance on computerized information has grown, so have threats related to its security. The latest PowerEdge servers are Dells most secure servers yet. To protect the confidentiality, integrity, and availability of data, Dell has included a variety of features, such as a Trusted Platform Module (TPM), more features within the lockable chassis, and new RAID controller cards that protect against the failure of two drives. We offer the latest proven technology, such as a pair of quad-core Intel® Xeon® processors and a variety of network interface options. Together, these components are designed to dramatically boost performance. Dell knows that the management of technology often costs more than the technology itself. So weve worked to include many features to simplify the task. Whether you want to work locally using USB flash drives or remotely via Wake-on-LAN or iSCSI boot, these servers offer greatly improved flexibility. Finally, the PowerEdge Behavioral Specification simplifies management by enforcing consistency in user interaction and hardware layout. 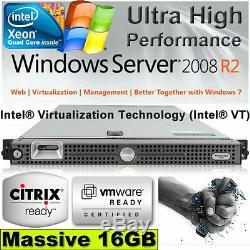 Poweredge 1950 III -1U Server- 2x 2.50Ghz Quad core (Total 8 Cores & Power Saving CPUs) Xeon L5420. 2x 73GB SAS 15K Original Dell 3.5 drives. Dell SAS 6i/ Integrated SAS / SATA RAID Controller card. Wo power supplies - Dual PSU 670W. Please send crossed and made payable to my address. We only use professional national couriers and all parcels are tracked and insured. The couriers will require a contact telephone number in order to deliver goods so please make sure you provide one when ordering. They will also require a signature so please make sure you select an address where someone will be available. Collection - Collection is possible at present from our Ealing office, W5 5EX. Please note when returning a item please provide your user id and a brief note explaining the reason for return. We also provide IT Infrastructure Solutions, System Integration, Network/Server Management services across UK. Anisatech was founded in 2004 with a view to endowing our clients with the optimum IT solutions in terms of hardware, software and network integration. The main functional areas were merely computer sales and maintenance. Nobody is perfect, but we will do our utmost to resolve any issues to your satisfaction. All subjective item descriptions are provided from our personal view and we aim to be as fair and honest as possible. Our cosmetics marks are also subjective and again are aimed to be an honest reflection of the product based on our experience. The item "DELL POWEREDGE 1950 III QUAD CORE (2x 2.50GHZ) 16GB RAM 146GB RAID Intel VT XEON" is in sale since Wednesday, August 1, 2012. This item is in the category "Computers/Tablets & Networking\Enterprise Networking, Servers\Servers, Clients & Terminals\Computer Servers". The seller is "anisatech" and is located in Ealing. This item can be shipped to all countries in Europe, all countries in continental Asia, Australia.